If Krsna favors a devotee then he puts them under pressure and extreme difficulty. Pure devotees have moral principles. They believe in fair play and honesty. And the evil dark side seeks to torture those pure devotees for their honesty. It is not a sin to suffer. To hurt others and cheat others is the sin. This is the real reason that Krsna appears in the material world, to protect to His devotees from the suffering and torture they endure on His behalf. Know within your self that Krsna is proud of you and He is the being that we all ultimately reckon to. Its a relationship between our soul and Him.It is not behoven to any others and is confidential and not understandable to the demonic. All the greatest and most glorified devotees in history endured unreasonable suffering and torture. How is this amazing thing? 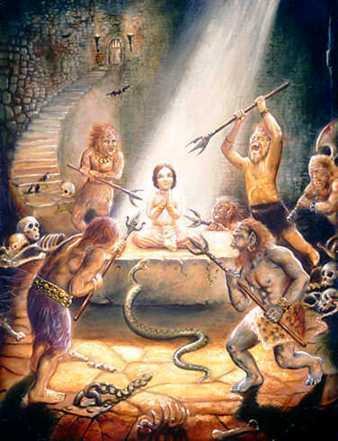 This is a type of initiation that cannot be bought with any amount of gold and silver. It is a direct arrangement of the Lord to facilitate our utter dependance of Him. We are all at the mercy of the Lord. we go beyond the limitations of ordinary circumstances and become transcendant. so we are also empty and non attached to it so it does not harm us. It affects all beings and things.Abandon attachment to it. We are Gods. We are at the mercy of our selves and at the mercy of no one else. Why is it so hard for us to accept who we are. Wake the Hell up from your earthly slumber. Aeons and aeons of sleeping. wake up Angels. Sylvano_Christiane...he changed his arrival...19 of may...he is getting a little unsecured , i calm him down...I feel him fron distance!! !Please a flow of energies untill the 19 of may?? ?Wanted to share,,,our metting is very important!! !MEETING OF LOST SOULS!!! namaste!!! will share our music-love to people here in Greece...we have a lot to give!!! Can I introduce you to my lovely YAM ---? You want Peace, then become the Peace. Its your drama. You are the director, producer, the writer and you picked humanity to be your players. Wow. And you don't even know that. Then remember, there can only be ONE. Your Devotion should be to Self. When the Western Union knocks on your door. You accept the message and move on. First, you are Krishner, You are the Christ, you are Mohammed, you are all of it. They are the reflection of you. These things you created to help you awaken to who you are. Your devotion should be to the Mighty I AM Presence. Everything outside of your self is Maya, or the Illusion. If you cannot love God, then you cannot yourself. Never give up in the name of LOVE !!! Sylano-Christiane: guitarre-piano...coming the 21 of may. Yes, happiness is the interval between two pains & being neither inflated by praise nor deflated by criticism & remaining in that space 'in between', unaffected by this 'illusory drama' is the aim...our mind is our architect & a bundle of desires, so if we can detach as you say we can find that freedom of peace that we seek...The 'master trickster 'the 'Lower/shadow self, Ego (Edging God Out) will put up a 'self justified fight' until the bitter end, so by letting go of the (emotional) attachments & becoming 'empty' (hollow) & straight (holding out to a dharmic path) as Lord Krishna's flute, we can be blessed with the 'kiss' from His Lips as He plays His Divine song through us!